On this webpage "Dividing whole numbers", we are going to see how to divide whole numbers. When we divide a number by another number, we will have the terms dividend, divisor, quotient and remainder. 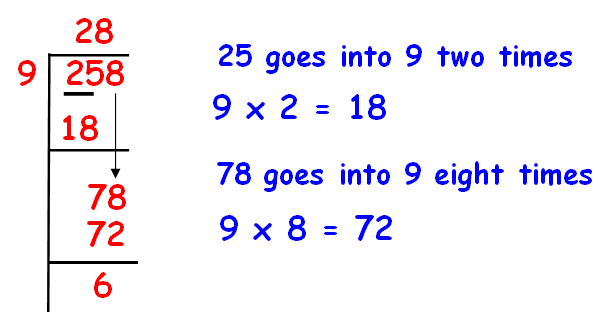 To know more about these terms let us look into the division algorithm. When we divide a number by another number, the division -algorithm is, the sum of product of quotient & divisor and remainder is equal to dividend. The number which we divide is called the dividend. The number by which we divide is called the divisor. The result obtained is called the quotient. The number left over is called the remainder. 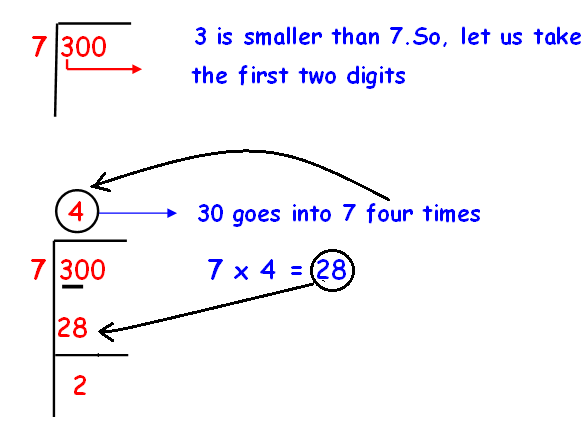 Take the first number of dividend and and check whether it is greater than the divisor. By subtracting 28 from 30 we get 2. Here, we have to bring down the next digit of the given number. That is 0. Now we have to take this 2 along with 0 and divide this 20 by 7. Let us the next example of "Dividing whole numbers". 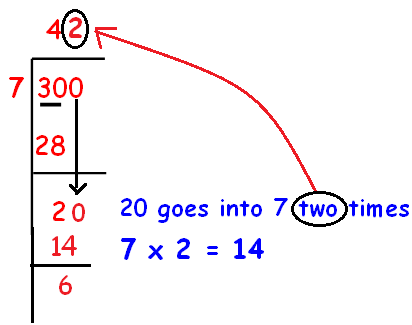 Divide 258 by 9, list out dividend, divisor, quotient, remainder and write division-algorithm. Divide 400 by 8, list out dividend, divisor, quotient, remainder and write division-algorithm. Divide 1675 by 13, list out dividend, divisor, quotient, remainder and write division-algorithm. Divide 750 by 16, list out dividend, divisor, quotient, remainder and write division-algorithm. After having gone through the stuff given above, we hope that the students would have understood "Dividing whole numbers"